Pujara hit his second century of the series, a dogged but faultless 106 off 319 balls, to ensure that India consolidated the good start of the first day. At stumps, Australia were placed at 8 for no loss from 6 overs with openers Aaron Finch and Marcus Harris were both unbeaten on 3 and 5 respectively. India lead by 435 runs. Post-tea, it was a comedy of fielding errors from Australia as they missed three easy chances, all of Nathan Lyon (1/110) in what proved to be a frustrating 48 overs from him. Rishabh Pant (39) played uncharacteristic defensive innings, and the only aerial stroke he played was in the 159th over off Lyon when Cummins spilled the chance at long on. He was on 15 then. Australia took the third new ball in the 167th over and it worked as Pant looped up a catch to Usman Khawaja behind the wickets off Mitchell Starc (2/87). Post lunch, Kohli-Pujara took their third-wicket partnership to 170 runs before the game turned. The Indian skipper took medication for some back issue and then stepped through the gears as he brought out two pulls against Mitchell Starc (1/68) in the 123rd over. He pressed on the accelerator a tad too much, and cut straight to third man, much to the bowler’s delight. Four overs later, in the 126th, Pujara got a delivery from Cummins that kept a tad low and knocked back his stumps as India were suddenly reduced to 299/4. In the morning session, Pujara scored his 17th hundred as India reached 277/2 at lunch. 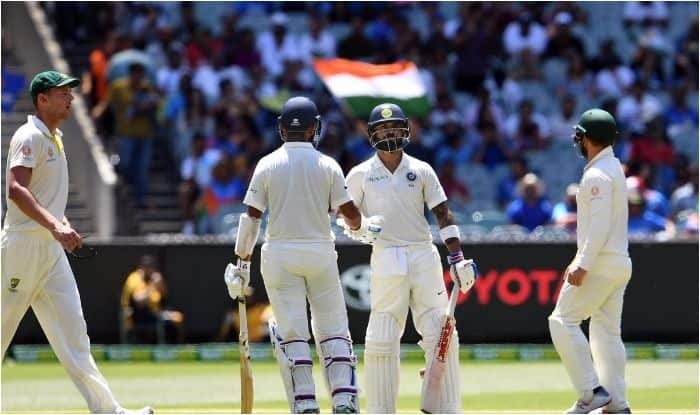 Starting from overnight 215/2, India looked ready for another hard day’s grind, with Kohli reaching his 20th Test half-century, off 110 balls, in the very first over of the day.